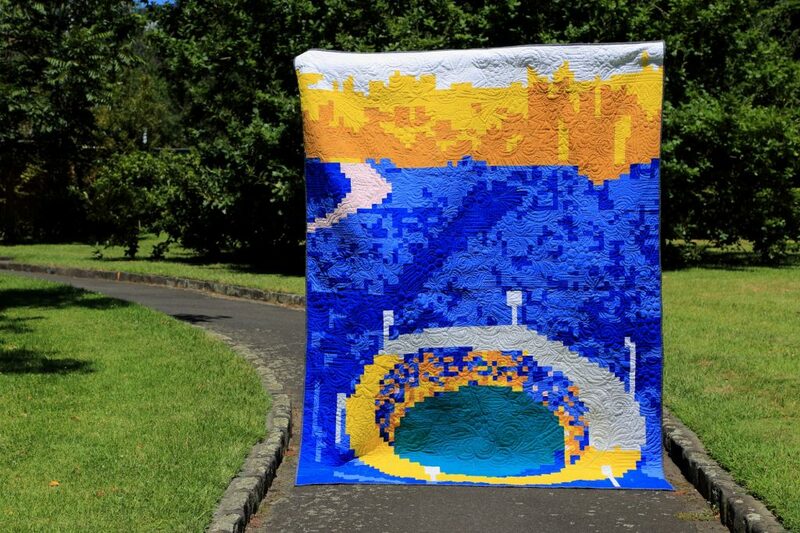 One of our members, Andi Herman, is the owner of YouPatch – a pixel quilt design software that plays in perfectly with the idea of playing with scale by using the small piecing to create a large image. 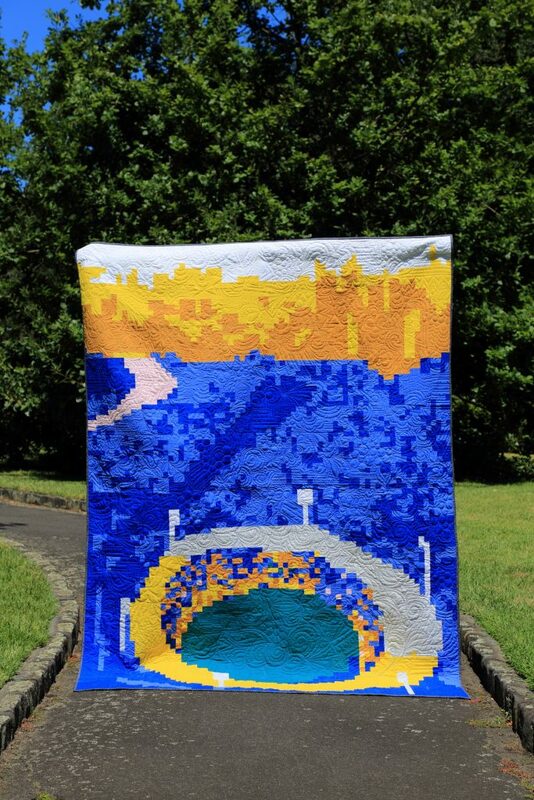 We used the coordinating Kona colours – White, Silver, Pink, Citrus, Yarrow, Ultramarine, Hyacinth, and Ocean – to create a pixel quilt of the Melbourne skyline, including the Yarra River and the MCG. Our quilt, “The G”, is named for the large sporting ground in the quilt. The Melbourne Cricket Ground is affectionately known as “The G” and is Australia’s largest sporting stadium. Another of our members, Erin Barry, is a longarm quilter at Quilt By Starlight. Her passion is graffiti quilting and as our beautiful city is known for its street art, it was a match made in quilty heaven! If you peek closely enough, you will be able to find MMQG discreetly tagged in there somewhere. We used a local designer’s fabric for the backing and binding as Emma Jean Jansen’s Melba fabric collection was the perfect choice for this quilt – trams, tickets, suburbs! A huge thanks to all those involved in the process, from design to cutting to sewing. Many members helped to piece the blocks and sew the rows at our Sit And Sew Days, as well as at home. If you see it at QuiltCon, be sure to tag us on Intsagram – @melbmqg – to share it with us!